The fingers are thin appendages at the end of the hand. Each digit is individually controlled by various muscles with a long tendons lying in the hand or forearm. Most of the finger is occupied by bone, tendons, ligaments with fascia and varying amounts of subcutaneous fat. There are no muscles in the fingers of despite the digits being the most flexible parts of the human body. It also has a high concentration of sensory receptors particularly on the pads of the fingertips thereby making it one of the most parts of the body, second only to the genitalia. Although the fingers are such small structures, it is highly prone injury as it is the most active parts of the body. Why do the fingers swell? Swelling is the accumulation of fluid within tissue thereby causing it to increase in size and compress against surrounding structures. In terms of that fingers, the swelling may be in the tissue around the bone (soft tissue swelling), in the bone itself (bony swelling) or the joints of the fingers (joint swelling). It is important to identify exactly which areas swollen as the causes and differ for each location of swelling within the finger. Sometimes a mass or collection of fluid may also cause localized swelling rather than enlargement of the finger as a whole. 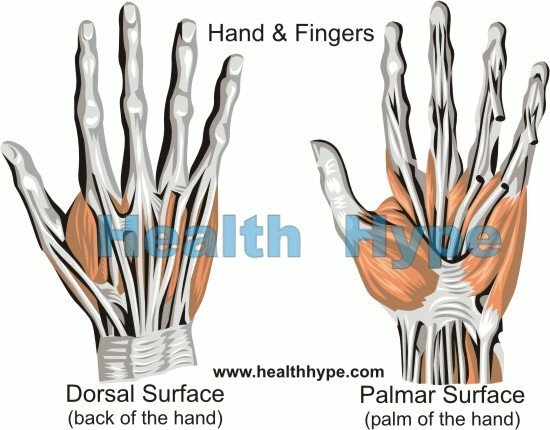 In many instances, finger swelling is associated with swelling of the hand in which case the front or back of the hand (palmar or dorsal surfaces) will be swollen along with all the fingers. This has been discussed further under swelling of the hands. Finger swelling in this article is where there is fluid accumulation isolated to one or more fingers only and/or its joints, but not involving the front or back of the hand. Most cases of swelling of the fingers, as with any other part of the body, is related to to inflammation. The inflammatory process is the body’s response to any injury that is intended to minimize the damage to tissue. Swelling is just one feature that arises with inflammation and a person may also experience pain, redness and heat of the finger all of which are symptoms of the inflammatory process. Most of the causes are as a result of inflammation due to injury of the fingers and all hand. With the fingers being such an active part of the body is often the most likely part to become inflamed whether due to a mechanical or chemical injury or an infection. However, fingers swelling may sometimes be a symptom of a systemic disorder although it almost always occurs with hand swelling as well. 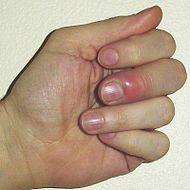 Various growths may arise in the tissues of the finger thereby appearing as localized masses or swellings. Blunt force injury usually from impact like a blow, striking a hard object, falling and so on. Fractures are break in the finger bones associated with more severe injuries as mentioned above. Stress fractures which are tiny cracks in the bone as a result of overuse and repetitive movements. Sharp force injuries which penetrate the skin associated with activities such as a pinprick or knife cut. It increases the chances of an infection of the finger. Animal bites and insect stings are more likely on the fingers are these other parts of the body that often make contact with animals and insect, particularly in children. Compression injuries related from using tight fitting rings. Foreign bodies which may lodge just under the skin or deeper in the tissue. It can remain asymptomatic for long periods of time before causing localised reactions with swelling. Hematomas where pockets of blood collect outside of the blood vessel usually after blunt force injury. Corrosive substances like acids which may cause chemical irritation and damage to the skin and underlying tissue of the finger. Sometimes these substances may elicit a localized allergic reaction. Infections are more likely to occur once the skin of the fingers has been damaged thereby allowing microorganisms, particularly bacteria, to enter the underlying tissues. An infection is more likely to occur with a break in the skin of the fingers because the hands are constantly making contact with various substances and surfaces (fomites) which may house large amounts of bacteria. Cellulitis is an infection of the skin and subcutaneous tissue. It is a very serious infection that can quickly lead to complications if it is not treated appropriately. Most cases are due to bacteria. Paronychia is an infection around the fingernails commonly seen in nail biters. The swelling is often isolated to the fingertips particularly around the edge of the fingernails. Septic arthritis is joint inflammation caused by the presence of microbes, particularly bacteria, in the joint spaces. Septic bursitis is inflammation of the small fluid filled sacs located throughout the body that reduces friction between tissues. Osteomyelitis is an infection of the bone which is more likely to occur when there are deep penetrating injuries or microbes travel through the bloodstream to the inner parts of the bone. Rheumatoid arthritis which is joint inflammation that occurs due to abnormal immune responses targeting the lining of the joint. Osteoarthritis which is a degenerative condition of the cartilage of the bones involved in the joint. It may also cause erosion of the bone over time. Osteoarthritis is less common in the finger joints than rheumatoid arthritis. Lymphedema is the accumulation of lymphatic fluid in the fingers usually due to an obstruction of the lymphatic vessels. This is sometimes seen with compression associated with a tight ring where the blood vessels are not entirely occluded. Abscess although swelling of the surrounding tissue is usually present as well. Foreign body lying superficially may also appear as a growth. Discoloration of the skin varying from redness associated with inflammation and allergic rashes to blue to purple hues. Pain in the finger or joint pain. Burning or itching of the finger. Abnormal sensations such as tingling, ‘pins and needles’ or numbness. Cold applications on the area. Removing any jewelry like rings or bracelets and handwear like gloves and wrist bands. Corticosteroid creams over the short term to reduce inflammation or allergic reactions.